In line with spring’s biggest colour trends, opt for the Hayfa men’s thobe in a stylish pastel palette of soft blue and cream, crafted in a luxurious and ultra-soft fabric with the perfect, modern tapered fit. In line with spring’s biggest colour trends, opt for the Hayfa men’s thobe in a stylish pastel palette of soft blue and cream, crafted in a luxurious and ultra-soft fabric with the perfect, modern tapered fit. Featuring a close, rounded neckline, the men’s jubba is finished with cream embroidered edging, coordinating V-shaped piping and tassel. 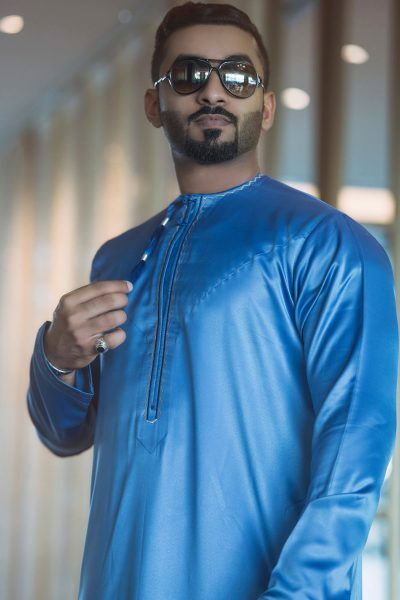 Simple, slick and stylish, the men’s Quriyat is the ideal contemporary thobe if you’re looking for a modern twist on a traditional look. In a warm colour palette of soft ivory and finished with rich deep red edging and detailing, the Masirah men’s thobe is a simple and stylish choice for any event both casual and formal.